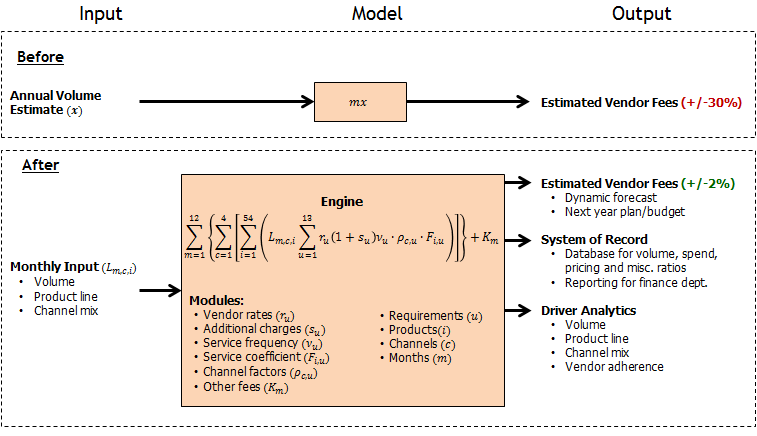 SPINNAKER builds predictive models utilizing statistical algorithms to solve for dynamic, non-linear environments (e.g. forecasting, staffing, workflow plans). We combine robust, powerful algorithmic platforms with our domain/functional expertise to create customized solutions for forecasting and decision-making. Click here to view abstracts of client projects in Predictive Analytics. In the example below, a client organization was using a rudimentary method to budget and track their vendor fees expense; the result was large fluctuations in forecasting that often left the finance department scrambling to alternately provide and capture budget relief. SPINNAKER collaborated with the client to capture historical patterns among hundreds of interacting variables, to develop a nonlinear, flexible and adaptive model for accurate, timely forecast. Additional system-of-record functionality and executive reporting benefitted the financial planning and analysis group as well as senior leadership at the client.